I've started making cards kits again and this time I am getting my Cricut and Scan n' Cut involved. There is definitely a learning curve - I am using my computer and scanner and the two cutting machines. Ever have an idea, you can see the beginning and the end, but the middle is a mystery? My first Cricut card, I thought this was so cute and it only took me three attempts to get it right! I know some people might think doing cards with cutting and not stamping is simple, It is not! Of course, I used Best Glue ever to hold all those layers, including the lettering - love the ultra fine tip for that! Next, I cut a piece of paper lace, just to see if I could! Not sure which Side I will use, but both are beautiful. This actually gives me an idea of how to use one-sided paper I don't like - we know there are usually many of those sheets if you buy stacks! Here is a fun freebie for you today! Oh Ginny that lace had me swooning - I am a big lace fan, and also dabble at making it, but that lace is stunning. 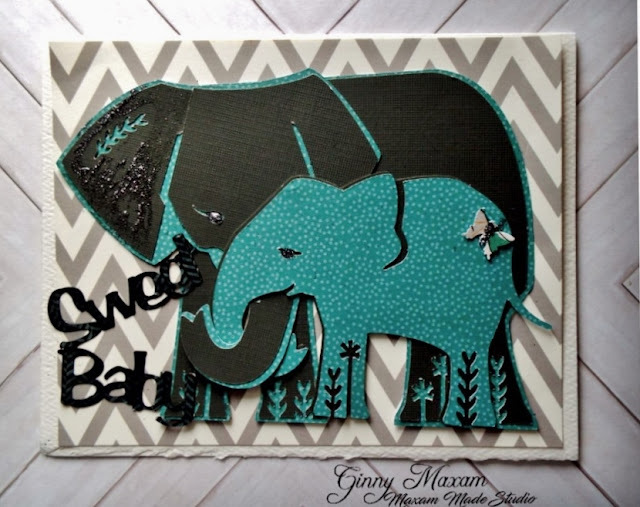 Your elephant card is stunning - so much detail and such a strong but tender image for a baby card. Wow, a Cricut AND a Scan & Cut! Plus, a computer, wow, that IS a lot of work, but these elephants are beautiful! How did you make the lace?